Jing Tong was very cute it has wishing sticks all over the little town, where people would pay $30 NT($1USD) for a bamboo tube and write their well wishes. 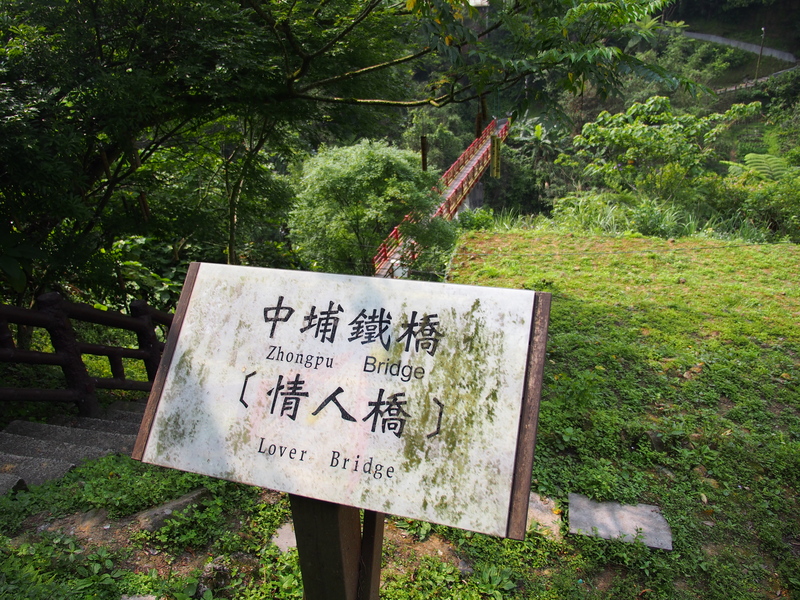 We also ventured to another Lover Bridge, a beautiful area where again we saw lots of wishing sticks. 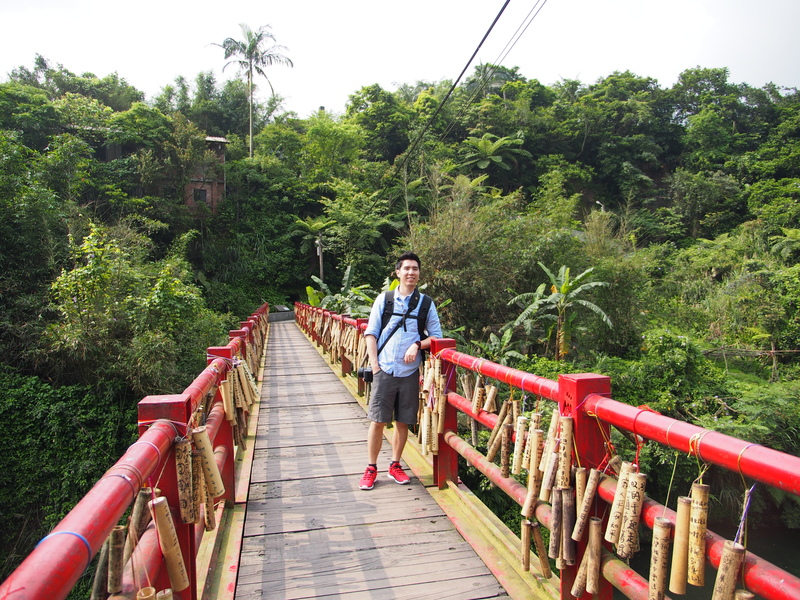 The area here was so beautiful, its super lush and green and the weather was amazing! 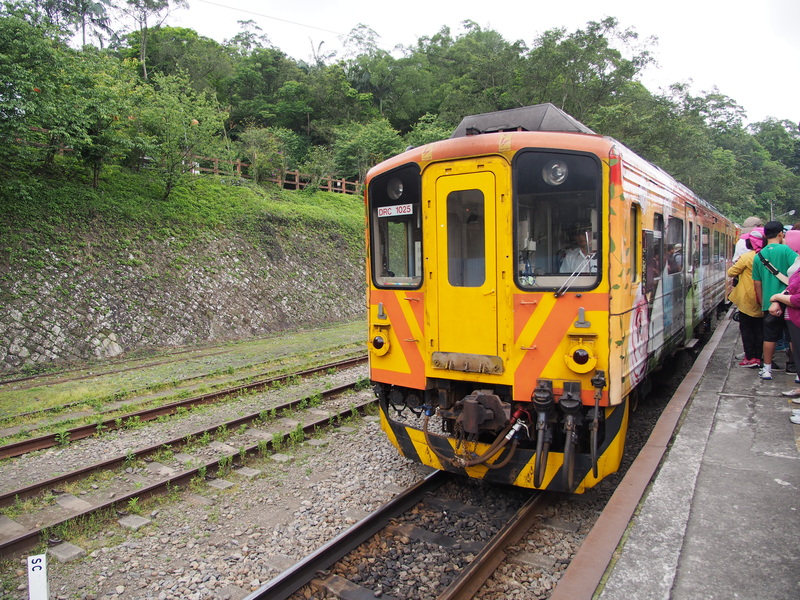 We finally boarded the train to Shi-fen, it’s about a 15 minute ride and a great way to travel from the towns! 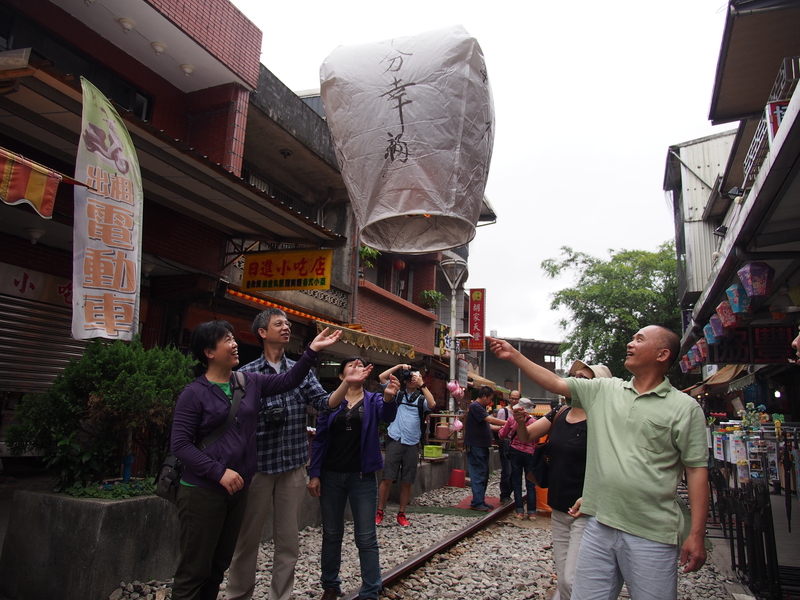 Shi-fen is a cute town with railroad tracks that go right through the town, the main attraction here is… SKY LANTERNS. 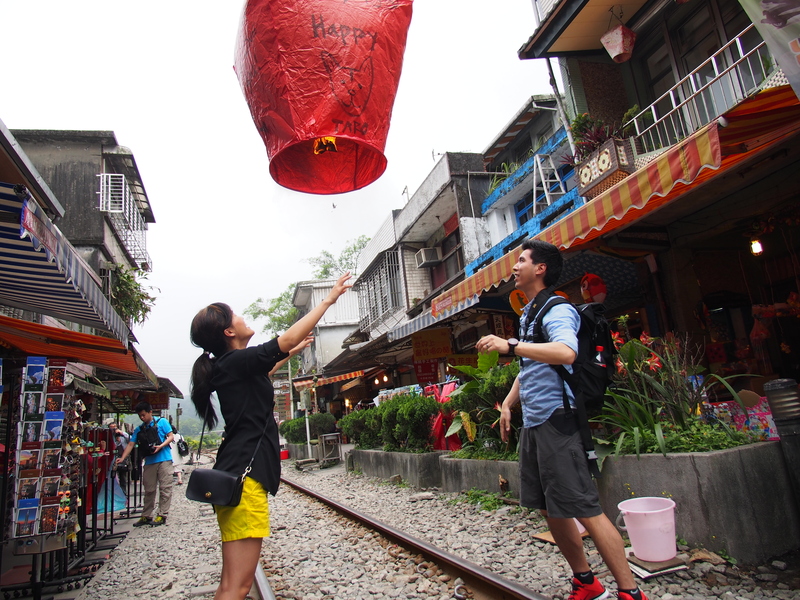 Every February there is a lantern festival where thousands of people come to release lanterns into the air, I have been wanting to do this for a long time now and am I was super excited it actually happened. This is probably the main reason this was my favorite day! 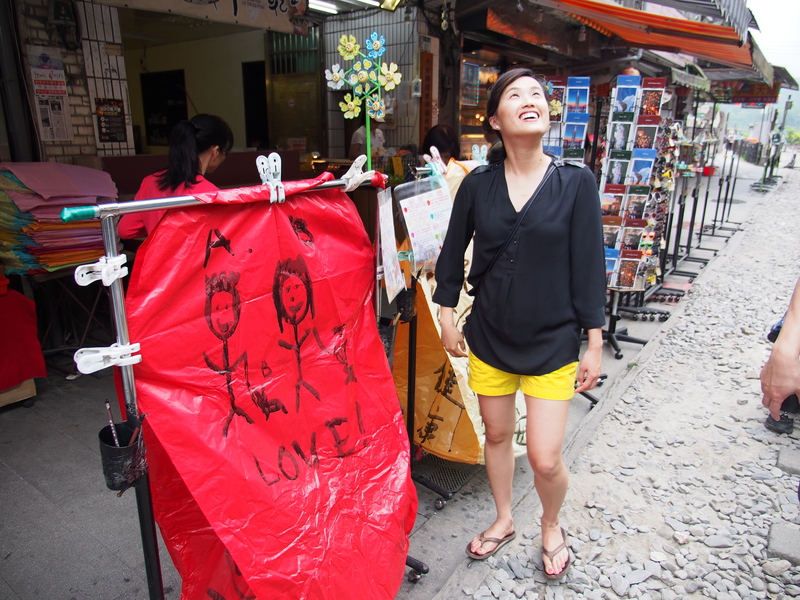 Everyone pretty much comes here to release a sky lantern, there are tons of choices and colors that represent different things. We decided to go with a red one and my parents got a white one, they help you up the lantern so you can write your well wishes. 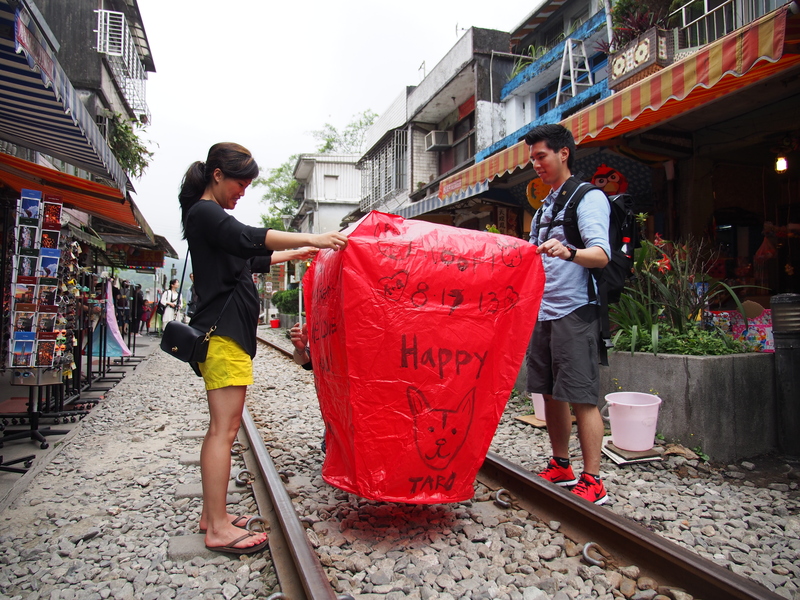 We did a few doodles, wrote a few words and was ready to release our lantern. Super fun to watch all the lanterns up in the sky. After my lantern dreams came true, we were on our way to check out the Shi-fen waterfall, but on our way there we ran into some ladies that told us that there was not much water running and it was still about another 15-20 minute walk. We decided that it wasn’t worth it and headed back to our cars. 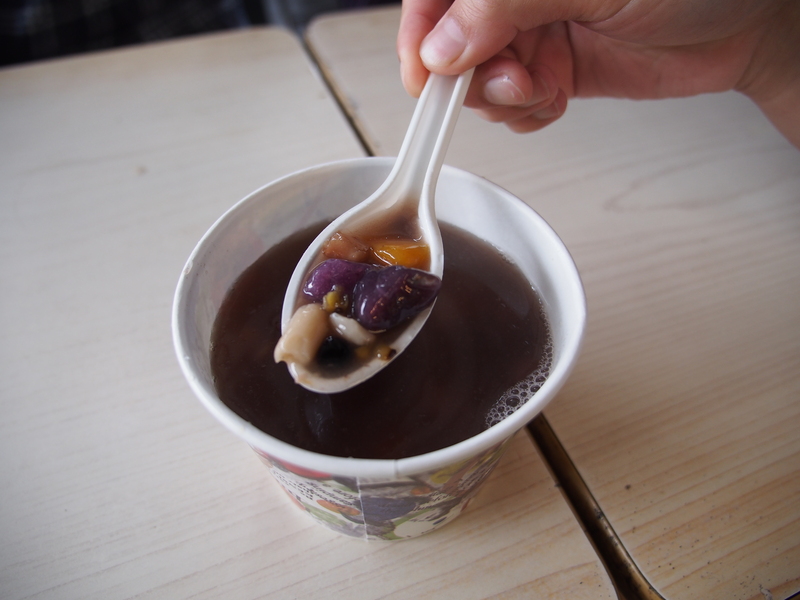 We were off to our next destination… Jiu Fen. The road to Jiu Fen is rather windy and up in the mountains, as we went further up it started to rain pretty hard and it was super foggy. 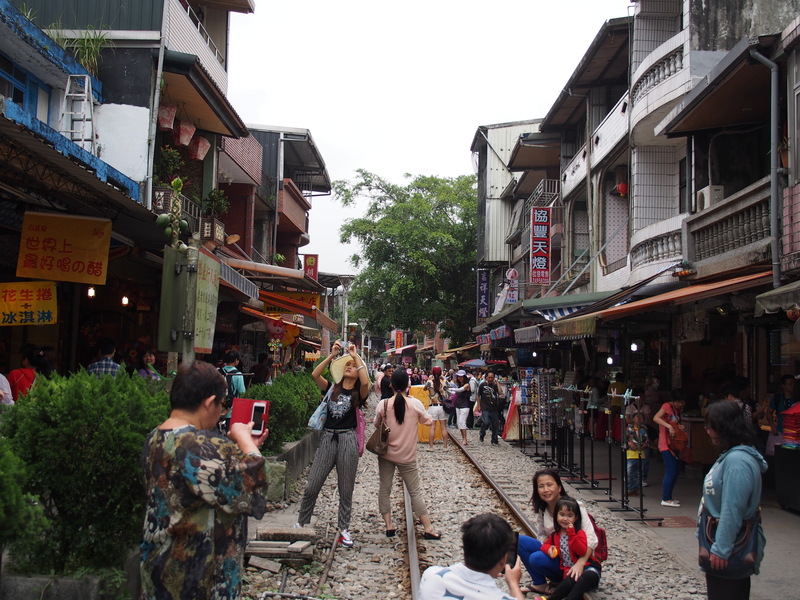 When we finally reached the old street, we almost decided not to go, however I told my dad since we are already here we might as well check it out. 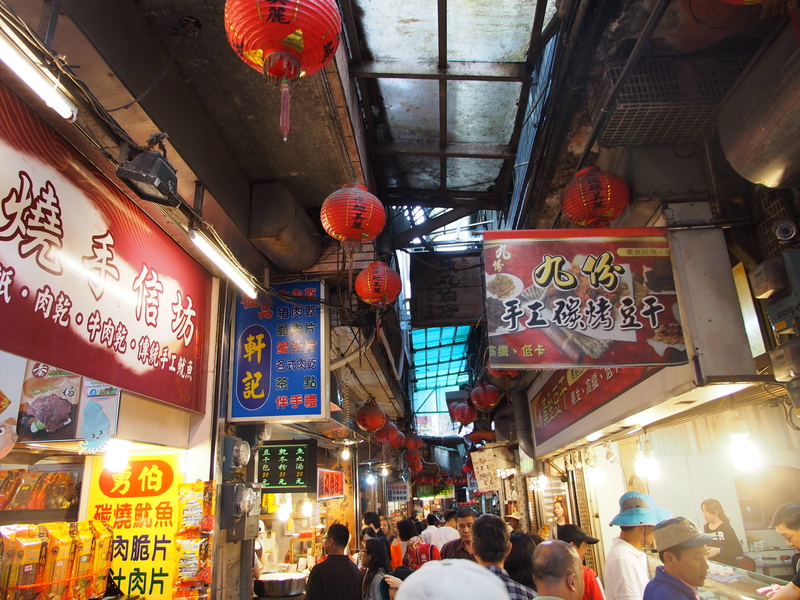 The old street is semi covered and is like an indoor market. 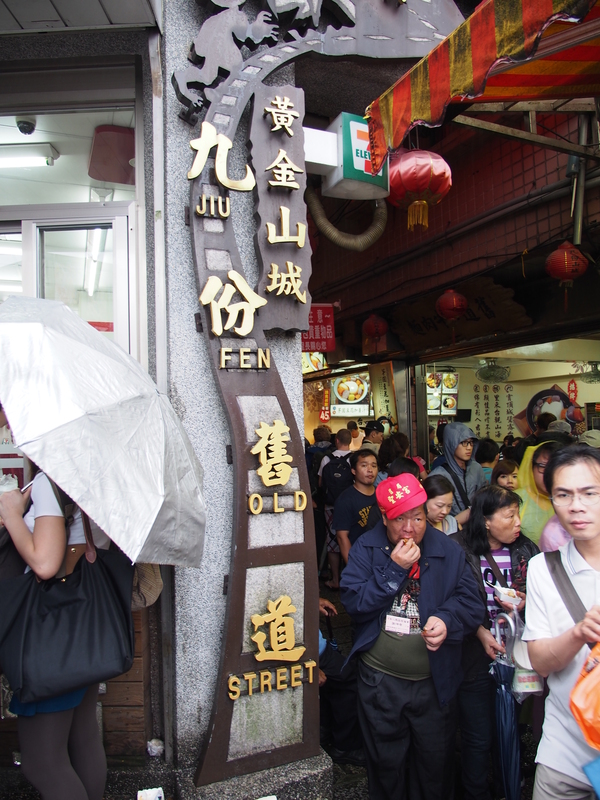 The old street is super packed with tourists and very narrow. 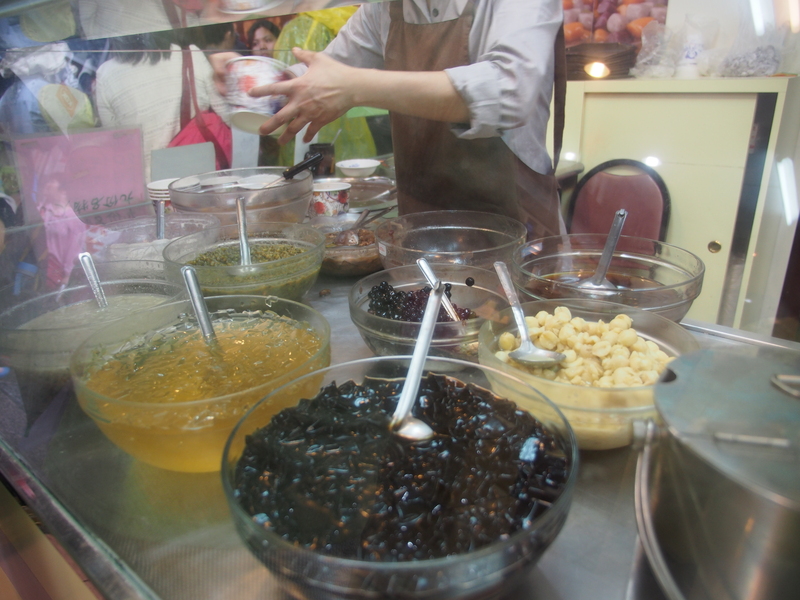 So what do you do at Jiu Fen…EAT! EAT! EAT! They are famous here for taro balls dessert, there is one famous place further in on the street, you will see it since there are a ton of people eating there. We ended up eating at one of the earlier ones at the beginning of the street. Still it was delicious, the taro balls are so soft and tender! 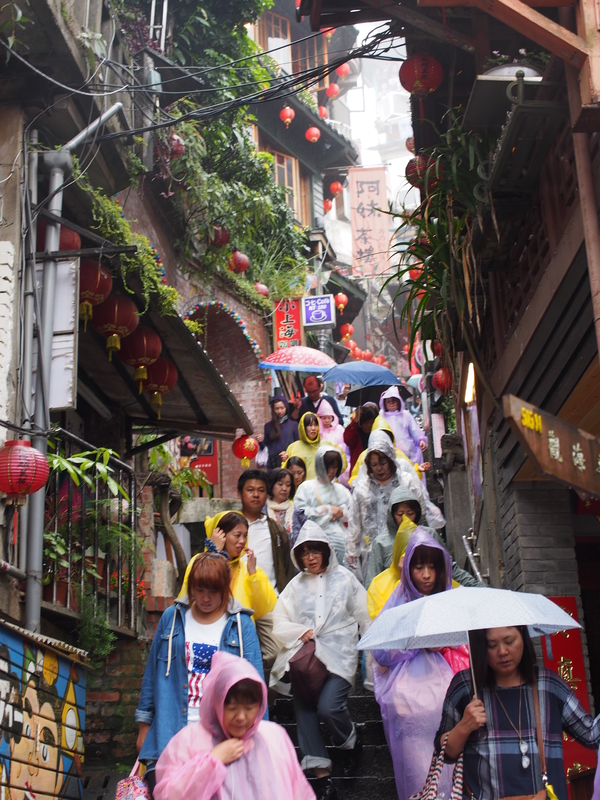 Next we walked around the crowded town, it was slightly raining so everyone was either wearing a poncho or holding an umbrella. 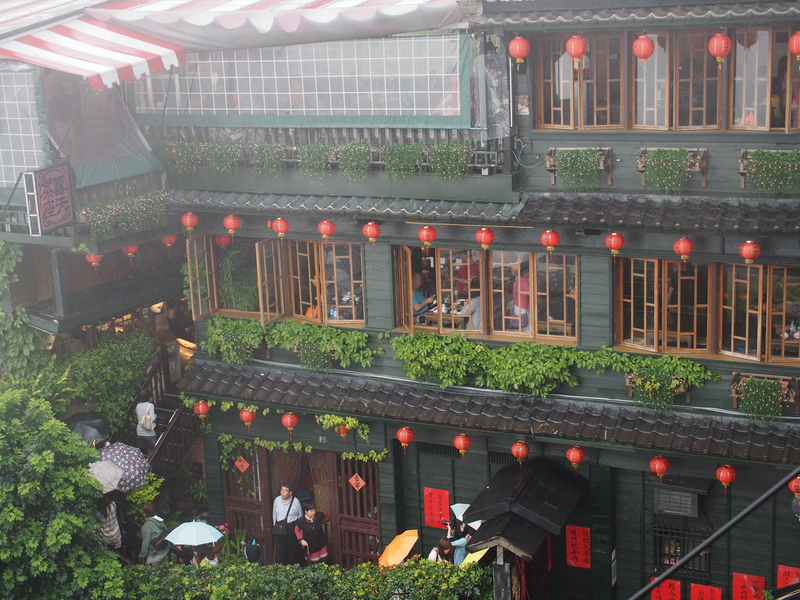 We went to a famous area where apparently a movie was filmed ” A city of sadness”, it was a beautiful area lots of red lanterns and cool walk way. I should check out the movie sometime. After much walking we decided to eat more! 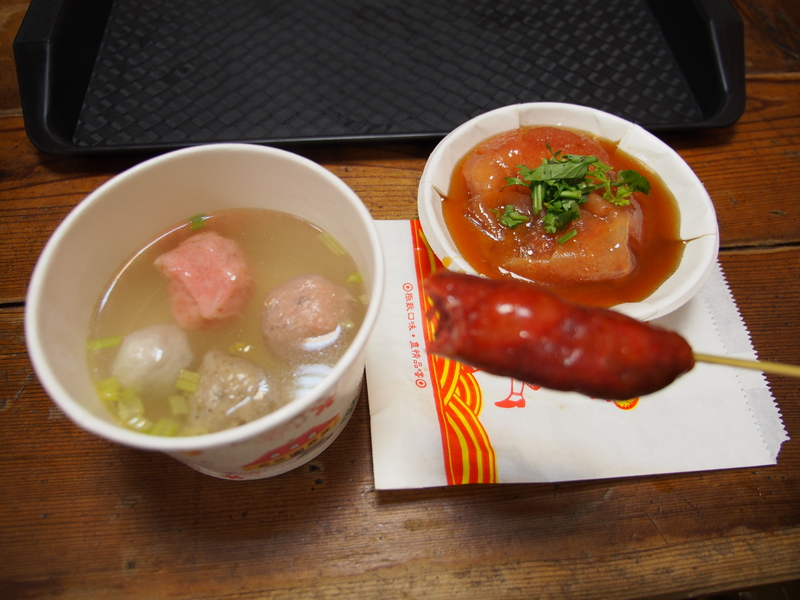 We got some Ba-Wan (literally a meat sphere), Chinese sausage, fish ball soup, and a taro filled pasty. 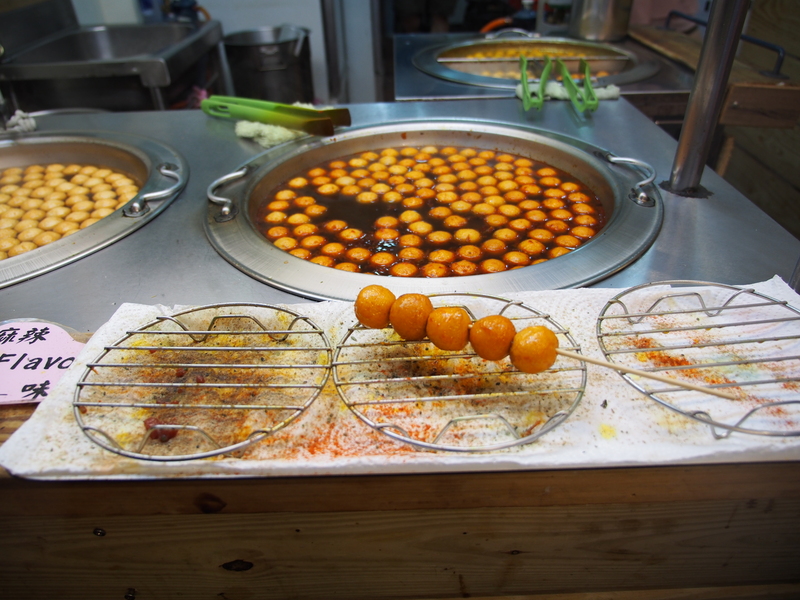 Of course we also had to get fish balls on a stick… Andrew wanted to order them super spicy, and they were so spicy it burned. It was my favorite snack that day! 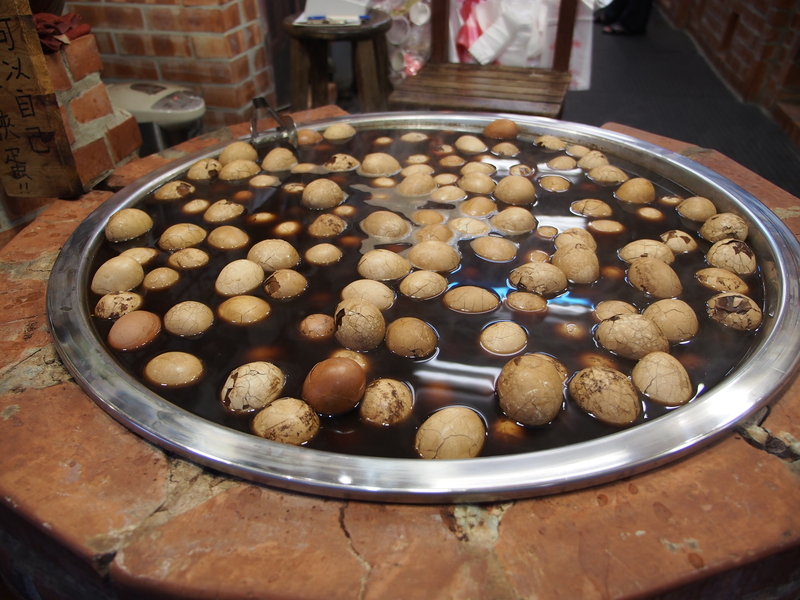 Also grabbed a tea egg on the way out of the old street since it looked so flavorful. If you thought the day was over… you’re wrong! 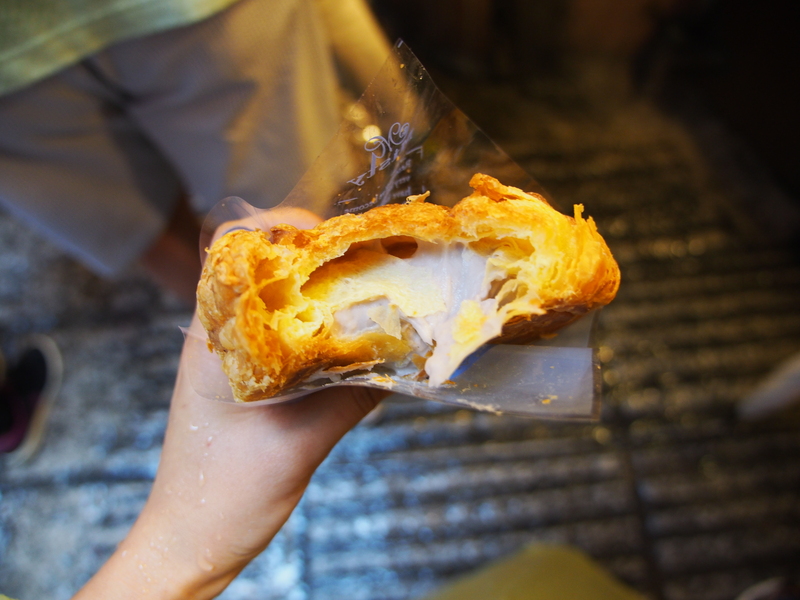 We took a ride up the north coast of Taiwan, I think it deserves its own post since it was so scenic and beautiful, we also end the day with some night market goodies! few of these responses appear like coming from brain dead individuals? 😛 And, if you are writing at additional online social sites, I would like to follow anything new you have to post. Would you make a list all of all your public sites like your linkedin profile, Facebook page or twitter feed?